Received: August 7, 2018; Revised: September 27, 2018; Accepted: October 25, 2018; Published online: January 1, 2019. Proton pump inhibitors are commonly utilized for the treatment of gastric acid-related diseases, such as gastroesophageal reflux disease, peptic ulcer disease, and Helicobacter pylori infection, and for the prevention of low-dose aspirin or nonsteroidal anti-inflammatory drug-induced peptic ulcers. Vonoprazan is a first-in-class potassium-competitive acid blocker, which has distinct advantages compared to other conventional proton pump inhibitors in terms of the efficacy for acid suppression. Due to its strong gastric acid suppression capabilities, vonoprazan serves as an effective drug for the treatment of gastroesophageal reflux disease and H. pylori infection. Gastric acid secretory inhibitors are effective agents in the treatment of gastroesophageal reflux disease (GERD), peptic ulcer disease, and Helicobacter pylori infection, and in the prevention of low-dose aspirin (LDA) or nonsteroidal anti-inflammatory drug (NSAID)-induced peptic ulcers.1–5 Since the market release of proton pump inhibitors (PPIs) in the late 1980s, the severity of the situation regarding gastric acid-related conditions improved dramatically. Vonoprazan, a first-in-class potassium-competitive acid blocker (P-CAB) made in Japan, appeared on the market in 2015, and exhibited rapid, strong, and continuous gastric acid suppression.6 As new P-CABs are becoming available, the standard treatment for acid-related conditions is changing. Vonoprazan was significantly effective in the treatment of H. pylori infection, GERD, and LDA-induced peptic ulcers.6,24 There are several advantages to using vonoprazan than conventional PPIs from a pharmacological point of view. It is rapidly absorbed in the small intestine where it accumulated in the canalicular membranes of parietal cells25 and it shows a greater acid-inhibitory effect than those of esomeprazole and rabeprazole, as observed from the first day of administration.26 It also has a longer duration of action. The pH 4 holding time ratios of vonoprazan were significantly longer than those of esomeprazole and rabeprazole.26 It does not require acid activation, whereas PPIs are acid-activated prodrugs that require acid protection. In addition, vonoprazan has a higher value of alkaline pKa (> 9) than PPIs, and previous P-CABs can be easily protonated and accumulated at high concentrations in the intracellular canaliculi of parietal cells.6,8 As such, vonoprazan is more stable in an acidic environment than PPIs.27 In addition, vonoprazan is shown to have consistent acid suppression capabilities irrespective of CYP2C19. It is metabolized to its inactive form mainly by CY-P3A4, and partially also by CYP2B6, CYP2C19, CYP2D6, and SULT2A1, whereas most PPIs are mainly metabolized by CY-P2C19.28 Therefore, vonoprazan showed quite rapid, strong, and continuous gastric acid suppression when compared to conventional PPIs. Tegoprazan is another potent and highly selective inhibitor of gastric H+/K+-ATPase. Interestingly, tegoprazan evoked a gastric phase III contraction of the migrating motor complex in a canine model.19 YH4808 had a faster onset than esomeprazole and can maintain an intra-gastric acidity of pH > 4 for a longer time during both day and night in healthy volunteers.20 DWP14012 showed rapid and sustained suppression of gastric acid secretion in healthy volunteers.22 KFP-H008 showed a more effective, potent, and longer-lasting inhibitory action than lansoprazole in a rat model.23 However, there are no reports about the usefulness of tegoprazan, YH4808, DWP14012, and KFP-H008 in actual clinical practice. Vonoprazan could be the first-line drug in the future. In CYP2C19 EM patients with erosive esophagitis, 90.0% treated with vonoprazan (20 mg/day) achieved mucosal healing at 2 weeks compared with the 79.3% that were treated with lansoprazole (P < 0.01).35 Similarly, at 4 and 8 weeks, the proportion of patients with healed erosive esophagitis tended to be higher in the vonoprazan group than in the lansoprazole group (at 4 weeks 96.1% vs 90.9%, P < 0.05; at 8 weeks 98.9% vs 94.5%, P < 0.03).35 Moreover, vonoprazan was more effective for severe erosive esophagitis (Los Angeles classification grades C/D) than lansoprazole (at 8 weeks 98.7% vs 87.5%, P < 0.01) and had more rapid effectiveness (at 2 weeks 88.0% vs 63.9%, P < 0.01; at 4 weeks 96.0% vs 80.6%, P < 0.03).35 Therefore, vonoprazan is highly effective for patients with more severe erosive esophagitis and CYP2C19 EM patients. Even in whole patients, vonoprazan is more effective than lansoprazole at each time point (at 2 weeks 90.7% vs 81.9%, P < 0.01; at 4 weeks 96.6% vs 92.5%, P < 0.01; at 8 weeks 99.0% vs 95.5%, P < 0.01). On the other contrary, no data showed that P-CAB was effective to relieve the symptoms of mild esophagitis and NERD. A non-randomized, controlled trial reported that 4-week treatment with vonoprazan (20 mg/day) was effective to relieve symptoms in 66.7% of NERD patients and 53.8% of PPI-resistant NERD patients.36 In summary, 4-week treatment with vonoprazan (20 mg/day) was effective as an initial therapy for severe erosive esophagitis (Fig. 1B), and 4-week treatment with vonoprazan and 8-week treatment with a PPI were recommended as initial therapies for mild erosive esophagitis and NERD (Fig. 1B). Conventionally, double dose PPI therapy, combination therapy of PPI and H2RA and the addition of a prokinetic agent to PPI were used for PPI-resistant reflux esophagitis (Fig. 2A).37–40 Vonoprazan seems to be effective for PPI-resistant reflux esophagitis.41 Twenty-four PPI-resistant reflux esophagitis patients were enrolled in this study and 58.3% had severe erosive esophagitis. In total, 87.5% of the whole patients and 85.7% of severe erosive esophagitis patients achieved endoscopic healing of erosive esophagitis at 4 weeks after drug change from PPI to vonoprazan (20 mg/day).41 In addition, the symptoms of GERD were significantly improved from the day after drug change.41 Vonoprazan (40 mg/day) rescue therapy may also be useful for PPI-resistant reflux esophagitis.42 Shinozaki et al43 reported that vonoprazan (10 mg/day; maintenance dose) treatment is also effective for PPI-resistant reflux esophagitis. Thus, we believe that the first choice for the treatment of PPI-resistant reflux esophagitis will be vonoprazan in the near future (Fig. 2B). There is no evidence of P-CAB plus prokinetic combination treatment for PPI-resistant reflux esophagitis until now. Further study is needed to additional effect of prokinetics on P-CAB based treatment. Vonoprazan-amoxicillin-clarithromycin triple regimen dramatically improved the eradication rate of first-line H. pylori treatment. The eradication rate was 92.6% with vonoprazan-based triple therapy versus 75.9% with lansoprazole-based triple therapy.53 The eradication rate was significantly higher with vonoprazan compared with lansoprazole in those patients infected with clarithromycin-resistant strains (82.0% vs 40.0%, P < 0.01).53 In CYP2C19 EM patients, the eradication rate of vonoprazan-based triple therapy was significantly higher than that of lansoprazole-based triple therapy (92.9% vs 75.0%, P < 0.01).53 In CYP2C19 PM patients, there was no significant difference, but the rate of vonoprazan-based triple therapy was high compared with the rate of lansoprazole-based triple therapy (90.9% vs 81.3%, P = NS). Conversely, the rate of the second-line metronidazole and amoxicillin-based triple therapy did not differ significantly between the PPI and vonoprazan groups (96.8% vs 90.5%, P = NS).54 A meta-analysis showed that vonoprazan- and conventional PPI-based therapies are similarly effective in eradicating clarithromycin-susceptible H. pylori strains (95.4% vs 92.8%, P = 0.230), and that vonoprazan-based triple therapy was significantly superior to PPI-based therapy in treating patients infected with clarithromycin-resistant H. pylori strains (82.0% vs 40.0%, P < 0.01).55 Ono et al56 showed that a clarithromycinmet-ronidazole-vonoprazan regimen had greater efficacy than clarithromycin-metronidazole-PPI regimen for penicillin allergy patients (92.9% vs 54.6%, P < 0.01). There is geographic distribution of resistance to clarithromycin and metronidazole in H. pylori. High resistance to clarithromycin and low resistance to metronidazole are found in Japan.57 Further studies are needed to evaluate the efficacy of vonoprazan-based therapy because vonoprazan has been approved only in Japan, Philippines, Singapore, and Thailand at this time. The Maastricht V/Florence Consensus Report recommended that the optimal regimen should be selected with the prevalence of antibiotic resistance rates (Fig. 3A).58 Amoxicillin-clarithromycin-PPI triple therapy without prior susceptibility testing should be abandoned when the clarithromycin resistance rate in the region is more than 15%.58 In the area with high resistance to clarithromycin and low resistance to metronidazole, amoxicillin-metronidazole-PPI triple regimen is recommended.58 In the area with dual resistance to clarithromycin and metronidazole, bismuth quadruple therapy is recommended. As a rescue treatment, bismuth quadruple therapy or quinolone-containing therapy is recommended.58 In the area with low resistance to clarithromycin, we recommend the amoxicillin-clarithromycin-vonoprazan triple regimen. If antimicrobial susceptibility testing is available, amoxicillin-clarithromycin-PPI triple regimen can be an alternative choice. In the area with high resistance to clarithromycin and low resistance to metronidazole, amoxicillin-metronidazole-vonoprazan or PPI triple regimen is recommended because there is no evidence of the amoxicillin-metronidazole-vonoprazan triple regimen being more effective than the amoxicillin-metronidazole-PPI triple regimen. 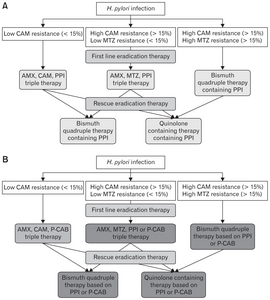 Little has been reported on bismuth quadruple therapy, quinolone-containing therapy, and vonoprazan (or other P-CABs)-based concomitant therapy; therefore, studies on this regard are expected (Fig. 3B). Currently, a phase III clinical trial for H. pylori eradication is being conducted in Korea to compare tegoprazan-amoxicillin-clarithromycin triple regimen with lansoprazole-amoxicillin-clarithromycin triple regimen. The long-term use of PPIs could cause the development of fundic gland polyps, carcinoid tumors, increase the risk of community acquired pneumonia, iron and vitamin B12 deficiencies, Clostridium difficile-associated diarrhea, dementia, and chronic kidney disease.25,65–72 Clinical trials evaluating the safety and tolerability of vonoprazan revealed that most of treatment-emergent adverse events with vonoprazan were mild in intensity and there was no obvious trend towards an increase in incidence over time up to 52 weeks of treatment.35,63 In these trials, hepatotoxicity was rarely observed. One differential characteristic of vonoprazan is that it is a pyrrole derivate, whereas previous P-CABs are imidazole-pyridine derivates, which might cause the hepatotoxicity of previous P-CABs (SCH 28080 and AZD 0865) and subsequent termination of their clinical development.73,74 Serum gastrin levels tended to be higher in the vonoprazan group than in the PPI group.75,76 Although there is no evidence that hypergastrinemia induced by PPIs or P-CABs causes neuroendocrine tumors in humans, P-CAB-induced stimulation of enterochromaffin cells and increased risk of neuroendocrine tumors remained. Bone fracture, hypomagnesemia, pneumonia, and C. difficile-associated diarrhea may also be caused by strong inhibition of gastric acid by continuous P-CABs treatment.6 In addition, parietal cell protrusion and dilated oxyntic glands can be observed after vonoprazan treatment.77 Vonoprazan treatment reduced the value of urea breath test in patients infected with H. pylori.78 The long-term (5 years) effect of vonoprazan is currently under examination in patients receiving maintenance treatment for healed erosive esophagitis, and complications of long-term vonoprazan use need to be re-evaluated in the future. Vonoprazan, an effective P-CAB, improves the treatment of gastric acid-related conditions including GERD, H. pylori infection and LDA/NSAID-induced peptic ulcers. It is highly likely that global standard therapy for gastric acid-related conditions will change in the future. The long-term safety of vonoprazan is still being investigated. Because studies on other P-CABs are limited, further research is required to show the superiority of other P-CABs to conventional PPIs. Fig. 2. Strategy of proton pump inhibitor (PPI)-resistant gastroesophageal reflux disease (GERD) treatment. (A) Conventional strategy of PPI-resistant GERD treatment (an abridged edition of the Evidence-based Clinical Practice Guidelines for GERD 2015 published by the Japanese Society of Gastroenterology). First choice is double dose PPI therapy. Switching to the other PPI is an option. Addition of prokinetics to PPI is effective in some cases. 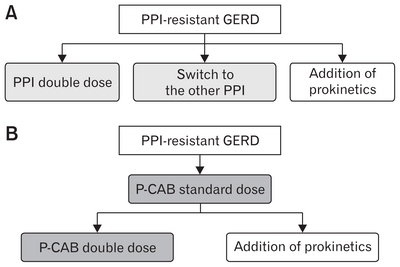 (B) The authors propose a new strategy of PPI-resistant GERD treatment. First choice is administration of potassium-competitive acid blocker (P-CAB) standard dose. Addition of prokinetics to P-CAB may have an additional effect. Financial support: This work was supported by a Grant-in-Aid for Scientific Research B (16H05291) to Hidekazu Suzuki from the Japan Society for the Promotion of Science. Conflicts of interest: Hidekazu Suzuki received scholarship funds for the research from Daiichi-Sankyo, EA Pharma, Otsuka Pharmaceutical, and Tsumura, and received service honoraria from Astellas, AstraZeneca, Daiichi-Sankyo, Otsuka Pharmaceutical, Mylan EPD, Takeda Pharmaceutical, and Tsumura. Author contributions: Hideki Mori and Hidekazu Suzuki wrote the manuscript; Hideki Mori made the Figures; and Hidekazu Suzuki supervised the all preparation of this article. Mori H, Suzuki H, Matsuzaki J, et al. Efficacy of 10-day sitafloxacin-containing third-line rescue therapies for Helicobacter pylori strains containing the gyrA mutation. Helicobacter 2016;21:286-294. Mori H, Suzuki H, Matsuzaki J, et al. Rifabutin-based 10-day and 14-day triple therapy as a third-line and fourth-line regimen for Helicobacter pylori eradication: a pilot study. United European Gastroenterol J 2016;4:380-387. Gyawali CP, Fass R. Management of gastroesophageal reflux disease. Gastroenterology 2018;154:302-318. Tajima A, Koizumi K, Suzuki K, et al. Proton pump inhibitors and recurrent bleeding in peptic ulcer disease. J Gastroenterol Hepatol 2008;23(suppl 2):S237-S241. Mo C, Sun G, Wang YZ, Lu ML, Yang YS. PPI versus histamine H2 receptor antagonists for prevention of upper gastrointestinal injury associated with low-dose aspirin: systematic review and meta-analysis. PLoS One 2015;10:e0131558. Huang JQ, Hunt RH. Pharmacological and pharmacodynamic essentials of H2-receptor antagonists and proton pump inhibitors for the practising physician. Best Pract Res Clin Gastroenterol 2001;15:355-370. Shin JM, Kim N. Pharmacokinetics and pharmacodynamics of the proton pump inhibitors. J Neurogastroenterol Motil 2013;19:25-35. Ishizaki T, Horai Y. Review article: cytochrome P450 and the metabolism of proton pump inhibitors--emphasis on rabeprazole. Aliment Pharmacol Ther 1999;13(suppl 3):27-36. Deshpande N, VS , VVRK, et al. Rapid and ultra-rapid metabolizers with CYP2C19*17 polymorphism do not respond to standard therapy with proton pump inhibitors. Meta Gene 2016;9:159-164. Andersson T, Holmberg J, Röhss K, Walan A. Pharmacokinetics and effect on caffeine metabolism of the proton pump inhibitors, omeprazole, lansoprazole, and pantoprazole. Br J Clin Pharmacol 1998;45:369-375. Abelö A, Andersson TB, Antonsson M, Naudot AK, Skånberg I, Weidolf L. Stereoselective metabolism of omeprazole by human cytochrome P450 enzymes. Drug Metab Dispos 2000;28:966-972. Kuo CH, Lu CY, Shih HY, et al. CYP2C19 polymorphism influences Helicobacter pylori eradication. World J Gastroenterol 2014;20:16029-16036. Junghard O, Hassan-Alin M, Hasselgren G. The effect of the area under the plasma concentration vs time curve and the maximum plasma concentration of esomeprazole on intragastric pH. Eur J Clin Pharmacol 2002;58:453-458. Mejia A, Kraft WK. Acid peptic diseases: pharmacological approach to treatment. Expert Rev Clin Pharmacol 2009;2:295-314. Sachs G, Shin JM, Munson K, et al. Review article: the control of gastric acid and Helicobacter pylori eradication. Aliment Pharmacol Ther 2000;14:1383-1401. Yu KS, Bae KS, Shon JH, et al. Pharmacokinetic and pharmacodynamic evaluation of a novel proton pump inhibitor, YH1885, in healthy volunteers. J Clin Pharmacol 2004;44:73-82. Kim YG, Jang BI, Kim TN. A matched case-control study of a novel acid-pump antagonist and proton-pump inhibitor for the treatment of iatrogenic ulcers caused by endoscopic submucosal dissection. Gut and liver 2010;4:25-30. Takahashi N, Take Y. Tegoprazan, a novel potassium-competitive acid blocker to control gastric acid secretion and motility. J Pharmacol Exp Ther 2018;364:275-286. Yi S, Lee H, Jang SB, et al. A novel K+ competitive acid blocker, YH4808, sustains inhibition of gastric acid secretion with a faster onset than esomeprazole: randomised clinical study in healthy volunteers. Aliment Pharmacol Ther 2017;46:337-346. Kim E, Kim A, Yi S, et al. Effect of food on the pharmacokinetics of YH4808, a potassium-competitive acid blocker, after single- and multiple-oral dosing in healthy subjects. Eur J Clin Pharmacol 2018;74:1261-1272. Sunwoo J, Oh J, Moon SJ, et al. Safety, tolerability, pharmacodynamics and pharmacokinetics of DWP14012, a novel potassium-competitive acid blocker, in healthy male subjects. Aliment Pharmacol Ther 2018;48:206-218. Li CY, Su M, Yan YY, et al. KFP-H008 blocks gastric acid secretion through inhibiting H+-K+-ATPase. Eur J Pharmacol 2017;810:112-119. Oshima T, Miwa H. Potent potassium-competitive acid blockers: a new era for the treatment of acid-related diseases. J Neurogastroenterol Motil 2018;30:334-344. Scott DR, Munson KB, Marcus EA, Lambrecht NW, Sachs G. The binding selectivity of vonoprazan (TAK-438) to the gastric H+, K+ -ATPase. Aliment Pharmacol Ther 2015;42:1315-1326. Kagami T, Sahara S, Ichikawa H, et al. Potent acid inhibition by vonoprazan in comparison with esomeprazole, with reference to CYP2C19 genotype. Aliment Pharmacol Ther 2016;43:1048-1059. Chiba N, De Gara CJ, Wilkinson JM, Hunt RH. Speed of healing and symptom relief in grade II to IV gastroesophageal reflux disease: a meta-analysis. Gastroenterology 1997;112:1798-1810. Caro JJ, Salas M, Ward A. Healing and relapse rates in gastroesophageal reflux disease treated with the newer proton-pump inhibitors lansoprazole, rabeprazole, and pantoprazole compared with omeprazole, ranitidine, and placebo: evidence from randomized clinical trials. Clin Ther 2001;23:998-1017. Kawano S, Murata H, Tsuji S, et al. Randomized comparative study of omeprazole and famotidine in reflux esophagitis. J Gastroenterol Hepatol 2002;17:955-959. Zheng RN. Comparative study of omeprazole, lansoprazole, pantoprazole and esomeprazole for symptom relief in patients with reflux esophagitis. World J Gastroenterol 2009;15:990-995. Khan M, Santana J, Donnellan C, Preston C, Moayyedi P. Medical treatments in the short term management of reflux oesophagitis. Cochrane Database Syst Rev 2007:CD003244. Asaoka D, Nagahara A, Hojo M, et al. Efficacy of a potassium-competitive acid blocker for improving symptoms in patients with reflux esophagitis, non-erosive reflux disease, and functional dyspepsia. Biomed Rop 2017;6:175-180. Kinoshita Y, Hongo M. Efficacy of twice-daily rabeprazole for reflux esophagitis patients refractory to standard once-daily administration of PPI: the Japan-based TWICE study. Am J Gastroenterol 2012;107:522-530. Adachi K, Komazawa Y, Mihara T, et al. Administration of H2 receptor antagonist with proton pump inhibitor is effective for long-term control of refractory reflux esophagitis. J Clin Gastroenterol 2004;38:297-298. Lim HC, Kim JH, Youn YH, Lee EH, Lee BK, Park H. Effects of the addition of mosapride to gastroesophageal reflux disease patients on proton pump inhibitor: a prospective randomized, double-blind study. J Neurogastroenterol Motil 2013;19:495-502. Takeuchi T, Takahashi Y, Kawaguchi S, et al. Therapy of gastroesophageal reflux disease and functional dyspepsia overlaps with symptoms after usual-dose proton pump inhibitor: acotiamide plus usual-dose proton pump inhibitor versus double-dose proton pump inhibitor. J Gastroenterol Hepatol 2018;33:623-630. Hoshino S, Kawami N, Takenouchi N, et al. Efficacy of vonoprazan for proton pump inhibitor-resistant reflux ssophagitis. Digestion 2017;95:156-161. Iwakiri K, Sakurai Y, Shiino M, et al. A randomized, double-blind study to evaluate the acid-inhibitory effect of vonoprazan (20 mg and 40 mg) in patients with proton-pump inhibitor-resistant erosive esophagitis. Therap Adv Gastroenterol 2017;10:439-451. Shinozaki S, Osawa H, Hayashi Y, et al. Vonoprazan 10 mg daily is effective for the treatment of patients with proton pump inhibitor-resistant gastroesophageal reflux disease. Biomed Rep 2017;7:231-235. Ashida K, Iwakiri K, Hiramatsu N, et al. Maintenance for healed erosive esophagitis: phase III comparison of vonoprazan with lansoprazole. World J Gastroenterol 2018;24:1550-1561. 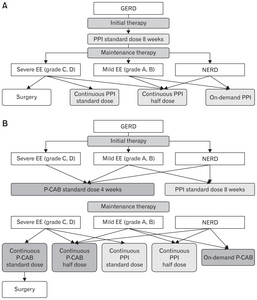 Leodolter A, Penagini R. On-demand therapy is a valid strategy in GERD patients: pros and cons. Dig Dis 2007;25:175-178. Umezawa M, Kawami N, Hoshino S, et al. Efficacy of on-demand therapy using 20-mg vonoprazan for mild reflux esophagitis. Digestion 2018;97:309-315. Kato M, Ito N, Demura M, Kubo K, Mabe K, Harada N. Study for every other day administration of vonoprazan in maintenance treatment of erosive GERD: study protocol for a multicentre randomised cross-over study. BMJ Open Gastroenterol 2018;5:e000197. Marcus EA, Inatomi N, Nagami GT, Sachs G, Scott DR. The effects of varying acidity on Helicobacter pylori growth and the bactericidal efficacy of ampicillin. Aliment Pharmacol Ther 2012;36:972-979. Villoria A, Garcia P, Calvet X, Gisbert JP, Vergara M. Meta-analysis: high-dose proton pump inhibitors vs. standard dose in triple therapy for Helicobacter pylori eradication. Aliment Pharmacol Ther 2008;28:868-877. Zhao F, Wang J, Yang Y, et al. Effect of CYP2C19 genetic polymorphisms on the efficacy of proton pump inhibitor-based triple therapy for Helicobacter pylori eradication: a meta-analysis. Helicobacter 2008;13:532-541. Furuta T, Shirai N, Sugimoto M, Nakamura A, Hishida A, Ishizaki T. Influence of CYP2C19 pharmacogenetic polymorphism on proton pump inhibitor-based therapies. Drug Metab Pharmacokinet 2005;20:153-167. McNicholl AG, Linares PM, Nyssen OP, Calvet X, Gisbert JP. Meta-analysis: esomeprazole or rabeprazole vs. first-generation pump inhibitors in the treatment of Helicobacter pylori infection. Aliment Pharmacol Ther 2012;36:414-425. Nishizawa T, Suzuki H, Fujimoto A, et al. Effects of patient age and choice of antisecretory agent on success of eradication therapy for Helicobacter pylori infection. J Clin Biochem Nutr 2017;60:208-210. Li M, Oshima T, Horikawa T, et al. Systematic review with meta-analysis: vonoprazan, a potent acid blocker, is superior to proton-pump inhibitors for eradication of clarithromycin-resistant strains of Helicobacter pylori. Helicobacter 2018;23:e12495. Ono S, Kato M, Nakagawa S, Mabe K, Sakamoto N. Vonoprazan improves the efficacy of Helicobacter pylori eradication therapy with a regimen consisting of clarithromycin and metronidazole in patients allergic to penicillin. Helicobacter 2017;22. Suzuki H, Mori H. World trends for H. pylori eradication therapy and gastric cancer prevention strategy by H. pylori test-and-treat. J Gastroenterol 2018;53:354-361. Malfertheiner P, Megraud F, O’Morain CA, et al. Management of Helicobacter pylori infection-the Maastricht V/Florence Consensus Report. Gut 2017;66:6-30. Dahal K, Sharma SP, Kaur J, Anderson BJ, Singh G. Efficacy and safety of proton pump inhibitors in the long-term aspirin users: a meta-analysis of randomized controlled trials. Am J Ther 2017;24:e559-e569. Iwakiri R, Higuchi K, Kato M, et al. Randomised clinical trial: prevention of recurrence of peptic ulcers by rabeprazole in patients taking low-dose aspirin. Aliment Pharmacol Ther 2014;40:780-795. Yang M, He M, Zhao M, et al. Proton pump inhibitors for preventing non-steroidal anti-inflammatory drug induced gastrointestinal toxicity: a systematic review. Curr Med Res Opin 2017;33:973-980. Sugano K, Kinoshita Y, Miwa H, Takeuchi T. Randomised clinical trial: esomeprazole for the prevention of nonsteroidal anti-inflammatory drug-related peptic ulcers in Japanese patients. Aliment Pharmacol Ther 2012;36:115-125. Kawai T, Oda K, Funao N, et al. Vonoprazan prevents low-dose aspirin-associated ulcer recurrence: randomised phase 3 study. Gut 2018;67:1033-1041. Mizokami Y, Oda K, Funao N, et al. Vonoprazan prevents ulcer recurrence during long-term NSAID therapy: randomised, lansoprazole-controlled non-inferiority and single-blind extension study. Gut 2018;67:1042-1051. Thomson AB, Sauve MD, Kassam N, Kamitakahara H. Safety of the long-term use of proton pump inhibitors. World J Gastroenterol 2010;16:2323-2330. Otsuka T, Sugimoto M, Inoue R, et al. Influence of potassium-competitive acid blocker on the gut microbiome of Helicobacter pylori-negative healthy individuals. Gut 2017;66:1723-1725. Hongo M, Fujimoto K. Incidence and risk factor of fundic gland polyp and hyperplastic polyp in long-term proton pump inhibitor therapy: a prospective study in Japan. J Gastroenterol 2010;45:618-624. Jianu CS, Fossmark R, Viset T, et al. Gastric carcinoids after long-term use of a proton pump inhibitor. Aliment Pharmacol Ther 2012;36:644-649. Lambert AA, Lam JO, Paik JJ, Ugarte-Gil C, Drummond MB, Crow-ell TA. Risk of community-acquired pneumonia with outpatient proton-pump inhibitor therapy: a systematic review and meta-analysis. PLoS One 2015;10:e0128004. Ito T, Jensen RT. Association of long-term proton pump inhibitor therapy with bone fractures and effects on absorption of calcium, vitamin B12, iron, and magnesium. Curr Gastroenterol Rep 2010;12:448-457. Yearsley KA, Gilby LJ, Ramadas AV, Kubiak EM, Fone DL, Allison MC. Proton pump inhibitor therapy is a risk factor for Clostridium difficile-associated diarrhoea. Aliment Pharmacol Ther 2006;24:613-619. Tai SY, Chien CY, Wu DC, et al. Risk of dementia from proton pump inhibitor use in Asian population: a nationwide cohort study in Taiwan. PLoS One 2017;12:e0171006. Keeling DJ, Laing SM, Senn-Bilfinger J. SCH 28080 is a lumenally acting, K+-site inhibitor of the gastric (H+ + K+)-ATPase. Biochem Pharmacol 1988;37:2231-2236. Echizen H. The first-in-class potassium-competitive acid blocker, vonoprazan fumarate: pharmacokinetic and pharmacodynamic considerations. Clin Pharmacokinet 2016;55:409-418. Kojima Y, Takeuchi T, Sanomura M, et al. Does the novel potassium-competitive acid blocker vonoprazan cause more hypergastrinemia than conventional proton pump inhibitors? a multicenter prospective cross-sectional study. Digestion 2018;97:70-75. Miyamoto S, Matsuno Y, Kato M, et al. Parietal cell protrusions and dilated oxyntic glands from use of vonoprazan. Am J Gastroenterol 2017;112:1899-1901. Takimoto M, Tomita T, Yamasaki T, et al. Effect of vonoprazan, a potassium-competitive acid blocker, on the 13C-urea breath test in Helicobacter pylori-positive patients. Dig Dis Sci 2017;62:739-745.